11.29.2010: What Does Godzilla Eat For Thanksgiving? 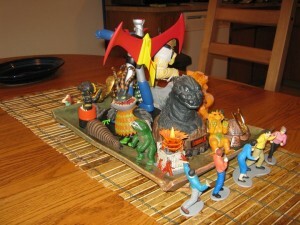 Godzilla, Gamera and an assortment of friends made up this year’s centerpiece at the Kaijucast Thanksgiving celebration! You know what I am thankful for? I mean, other than the family/friends standard answer… I’m thankful for these amazing movies and that so many people are able to look past their flaws and suspension-of-disbelief requirement and focus on the fantastic stories and craftsmanship that these films employ. I’m also thankful for the fine, outstanding citizens of the world that listen to this show. And this month’s show (which is episode number twenty-three and available right here). It seems that each episode I keep having to reel in the discussions in time for the show to come closer to it’s hour-ish long content. So because of that I’m considering a new format to the show – check out the poll to the right and let me know your thoughts. Martin Vavra was my guest again this month, and really, he just had some things he wanted to talk about regarding Godzilla films and it sounded like it could be a good episode. I was supposed to interview IDW Publishing about their upcoming Godzilla comic, but things got too busy and I sent the equipment to them too late. But that interview will happen for sure! In the meantime, however, here are the pieces of music that I chose for this month’s episode! 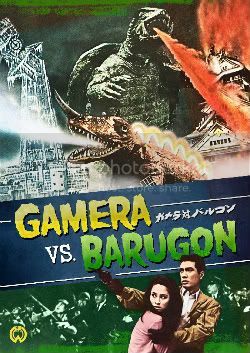 The Daikaiju Discussion for December will be for the 1966 Gamera vs Barugon. We’ll be watching the new Shout! Factory version of the film (available here). Just make sure that you watch the film and get your homework turned in before December 17th (early this month because of the holidays!). Just email your thoughts, questions & reviews to me and I’ll get your notes included in the December episode. You can download the twenty-third episode of the Kaijucast here! Feel free to write me if you are enjoying the podcasts or if you have any music requests, questions or even ideas for future shows, too. Thanks again for being the coolest listeners ever and sending in all of the feedback I’ve been getting. Don’t forget that if you live near Portland to check out those awesome events above!